Have you ever noticed that the MLS is full of many lame photographs. 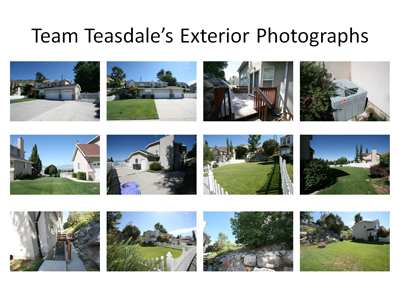 Team Teasdale Realty was hired to sell a certain home in Lindon, Utah. The previous Realtor's listing had expired. It was in the middle of the summer. Guess what? It still had snow in the photos. This sends the message to Utah buyers that the home has been for sale forever and that nobody wants this home. There was only a single photo of this home. If you look at the photos in the second slide, you will see our Associate Broker (Dave) took 12 exterior professional photos of this Lindon home. This helped our listing get several showing over the next two weeks. Buyers want to see lots of quality pictures. Make sure you hire an Agent who understands the importance of photography. Compare our photography to our competitors. 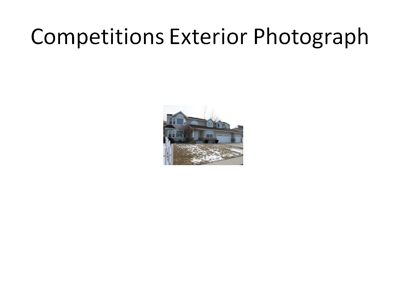 Many Realtors post only one or two exterior photographs. Really?? A buyer sitting in California and planning a flight to come to Utah County will make a list of all the homes (s)he wants to see before (s)he arrives. If you don't make the home look great, the buyers will not want to make the effort to come and see it. I recently went to buy an iPod cord on eBay and found some of the ads for a $3 item had more pictures than a $300k home in Lindon! If you are going to pay me a commission to sell your home in Utah County, I am going to give you the best marketing possible and work the hardest I can to get your home sold. Here are some more photos of this same home in Lindon that expired on the MLS. The previous Realtor took the photos on the left in blue. 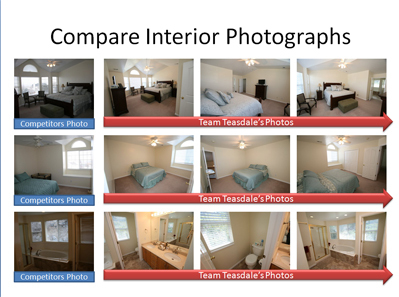 Our Associate Broker took the photos of the same room (in the red). Dave took several photos of each room, made sure there was proper lighting, and used a wide-angle lens. Buyers need to get excited about seeing your home. Mediocre photos will get you a lower offer and less interest. This is another small, yet significant, example of how our Team manages to sell such a huge volume of homes year after year. We pay attention to the details. Hire a Realtor who can make your home look the best in the neighborhood!